<span> element is a generic inline container. 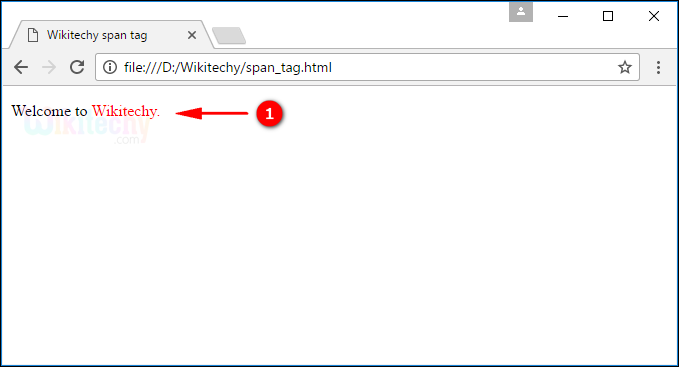 <span> tag does not make any visual changes in their elements the purpose of <span> tag is used to apply styles for their elements. <span> tag supports Global Attributes and Event Attributes. <span> tag belongs to Flow content and phrasing content. <span> tag used to apply style to the text “Wikitechy”. style attribute used to specify the color. It will be shown in red color. The output shows the “Wikitechy” in red color. <span> is alternate for <div> tag, the only difference is <span> tag is used for in line elements and <div> is used for block-level elements.